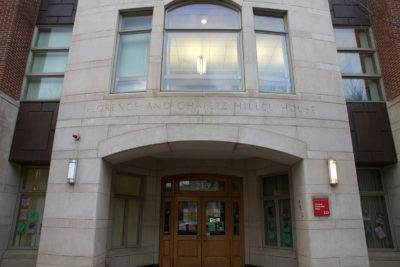 Following the resignation of the campus rabbi and executive director last year, Boston University’s Florence and Chafetz Hillel House has hired several new staff members who say they hope to lead the organization in a more positive and inclusive direction. Some of the recent additions to BU Hillel include both a new executive director and a new senior Jewish educator and campus rabbi, Linor Stein, Hillel’s Israel fellow, wrote in an email. Three years after transitioning from a career as a successful business executive to becoming a full-time rabbinical student, Jevin Eagle was not expecting to become the executive director of BU Hillel. Eagle said his personal experiences with Hillel also contributed to his decision to join the staff. Elie Lehmann, Hillel’s new campus rabbi, said the vast amount of potential for a thriving Hillel on BU’s campus was one of the factors that motivated him to take the position. “This Hillel was a very exciting opportunity for me because it was a very large and diverse Jewish population, one of the largest Jewish populations of anywhere in the country for undergraduate students, and it was in this pivot moment,” Lehmann said. He added that he is most excited to interact with students on a deeper level. Over the course of the summer months, Lehmann and Eagle began implementing significant changes to Hillel, including the creation of a strategic plan called the Path to Excellence. Eagle said the new strategic plan outlines a “very pluralistic, welcoming approach” to achieving BU Hillel’s new goals. Stein said that the BU Hillel staff already feels inspired by its new leaders. Several students said they are impressed with the changes that had been made so far and are excited about the direction BU Hillel is going under its new leadership. Emma Barg, a junior in the College of Arts and Sciences, said she contributed her vision for BU Hillel during the creation of the Path to Excellence strategic plan over the summer. “I wanted a place where everybody was welcome, there was different and new learning opportunities, a kinder place and just creating more personal connections with the students,” Barg said. Atid Malka, a junior in CAS, said he was surprised to see the large impact Eagle and Lehmann have made in their short time on campus. Yonina Brenner, a sophomore in CAS, said she has noticed a recent effort to increase the number of students who participate in Hillel events. I’m very proud of Elie, he was once my preschool student 2 years at B’nai Israel congregation in Gainesville, florida. You chose the right man for the job. Compassionate and loving, accepting everyone. Mazel Tov Elie!! !